Posted By PA Breast Cancer Coalition on August 30th, 2010 at 10:02 am | 114 comments. Blogs are one of my newest obsessions. I currently follow 66 different blogs, including this one by the PBCC. But I’m always on the hunt for more. I just love finding a new, cool blog to add to my list and scanning the posts multiple times each day. If you love blogs like I do, here are a few written by some pretty amazing breast cancer survivors. www.wecanrebuildher.com – Andrea is a young wife and mother who lives in Canada and is fighting breast cancer. Together with her husband Mark, she blogs about her cancer journey and takes lots of great photos. www.butdoctorihatepink.blogspot.com – Ann Silberman is a mother, wife, and Middle School secretary in Sacramento, CA. After her diagnosis in September 2009, she started a blog that’s full of humor and energy. www.goodcancer.blogspot.com – Another Californian, Jennifer Overbeck was diagnosed in 2006 at age 39. Though her treatment has been over for some time, she continues to blog sporadically to share news, thoughts on living beyond cancer, and updates from her 6-month checks. www.cancerspot.org – Jacki Donaldson was diagnosed in 2004 at the age of 34 and has been blogging ever since. I love her inspirational photos and quotes, as well as her stories of other survivors. She also frequently shares helpful cancer-related resources that she comes across. If you have any breast cancer blog recommendations, please send them my way. I’m always on the lookout! Posted By PA Breast Cancer Coalition on August 26th, 2010 at 9:45 am | 113 comments. While many of the PBCC staff were traveling across the state in July, running our 11 Home Run Derby fundraisers and trying to stay cool, I was sitting at my desk with a huge pile of FrontLine newsletter returns staring at me. The main part of my job entails keeping our database of over 78,000 constituents up-to-date. Every time we send out a mailing to these constituents, we receive hundreds of returns and notifications of forwards from the post office. I then have to update every one of those records in our database so the next time we send a mailing, it will go to the correct place! Many times, people move without a forwarding address. (Why? I don’t understand that! Don’t you want to get your mail at your new home?) When that happens, I have to remove those people from our list so we don’t continue to mail to someone who’s no longer at that address. It’s tedious work and takes me days and days each time we do a large mailing, which happens at least quarterly. But I really don’t mind! Don’t get me wrong, I do get bored after a while and have to get up from my desk, grab a cup of coffee, work on a different task. But I eventually get through the pile. And the feeling I get when that’s done is amazing. I enjoy knowing that our large database is as accurate as it can possibly be. I enjoy completing a task that seems insurmountable at the beginning. I enjoy the details, the names, the addresses. I enjoy making things right. My co-workers often tell me, “I do not want your job!” So I guess that means doing the tedious, boring stuff brings me job security. Well, you know what? I’ll take it! And I’ll smile all the way through…until September when the next FrontLine newsletter goes out. Posted By Dolores on August 24th, 2010 at 12:49 pm | 1458 comments. State Representative Nicholas A. Micozzie is teaming up with Fox Chase Cancer Center to offer mammograms to qualified women on Wednesday, September 1st at 9:00 AM. 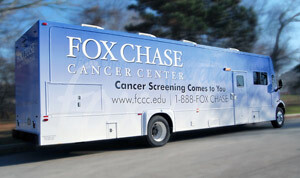 The mammography van will be located in St. Eugene’s parking lot on Oak Avenue in Primos. For directions, click here. Space is limited and appointments are required. To schedule, contact Rep. Micozzie’s Drexel Hill district office at 610-284-0020. Posted By PA Breast Cancer Coalition on August 9th, 2010 at 12:50 pm | 106 comments. 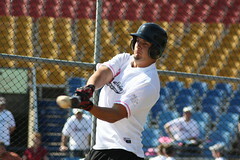 The home run derby crew rolled into FirstEnergy Stadium for the last event on Friday, July 30th. Pink bats have been awarded around the state to teams who knocked one out of the park, and one team would be lucky enough to get the last set in Reading. It was a fierce competition on the sunny Friday, so check out how the teams stacked up! The day was full of fun and batters of all ages came out to support the PBCC. The team representing Fleetwood Bank brought their own pitcher to throw softballs to the batters. While the softballs didn’t fly as far as a normal baseball, the team still finished with a great score! Congratulations ladies! Our winning team from Chesapeake Energy had two batters that each took 30 swings. During his time at bat, Nick Aspromonte hit two home runs! And single batter John Furlong also knocked one out of the park during his time at the plate! And a homer by Dante Cutrona from the Berks Bar Association. Congratulations fellas! With the end in sight, the derby crew looks forward to compiling all of the scores to create the statewide team leaderboard in addition to the statewide winner for our single batters. In the meantime, check out the pictures from the 11th and final stop of the 2010 derby! Posted By Dolores on August 2nd, 2010 at 5:26 pm | 3082 comments. The PA Insurance Department is offering a new program called PA Fair Care – Pennsylvania’s health plan for uninsured adults with pre-existing conditions. PA Fair Care will be administered statewide through a contract with Highmark Blue Shield. Benefits will include preventive care, physician services, diagnostic testing, hospitalization, mental health services and prescriptions. The cost to enrollees is a subsidized premium of $283.20 monthly. PA Fair Care will begin taking applications on Wednesday, August 4, after 8:30 a.m. To apply, applications can be completed online at www.PAFairCare.com, or those without internet access may apply with assistance from the toll free helpline – 1-888-767-7015 (TTY 1-888-767-7018) Monday thru Friday, 8:30 a.m. – 4:30 p.m. Anyone with questions, please call the toll free helpline at 1-888-767-7015.